However, things got a bit “sporty”. We rode around in the yacht (or at least some of us did, as we couldn’t all fit at the same time with the picnic) for a little bit and hung out in the sun. Note the patriotism demonstrated by crew. After we discovered how strong the current was after all the rain, we realized that it was going to be hard to get the ship back home upstream. Therefore, we had to come up with an alternate plan. It involved Adam scaling the wall. Once the yacht was aboard land, we came up with an another activity as can be seen below. I was a chicken at first but the group quickly convinced me to partake in the fun. 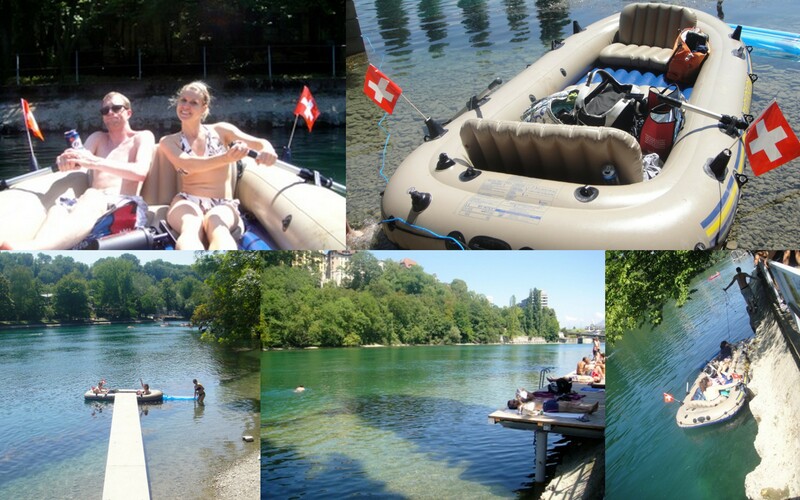 This entry was posted in Beaches, Geneva Activities, Lakes & Water, Summer, Switzerland. Bookmark the permalink. ← A traditional Chinese treat! Fantastic video – it should probably be a highlight on ESPN. Too bad DP wasn’t there to help get the boat upstream!